Submitted by JasonMichael on Tue, 01/07/2014 - 19:33. As a home inspector I often come across mold and never think much of the affects it can have on the body. As with anything, some people are more prone to have issues from mold. The worst story I have heard actually came from my wife, Brooke, a nurse in the Greensboro area. It changed both of our outlooks on mold. Brooke was taking care of a patient which had been admitted with a respiratory infection. The lady was 42 years old and only expected to be in the hospital for a couple of days. During a routine day the patient hit the call bell and Brooke responded. The patient was having trouble breathing and Brooke began getting her ready for a breathing treatment. What insued was something fit for a horror movie. The patient starting coughing up blood. Brooke said there was a look of complete and utter panic on the patients face. This led to more coughing and a black chunky substance began coming out of the patients mouth. The patient aspirated and became unresponsive, also known as coding. The staff was unable to revive the patient and she died. The black chunks coming from her mouth were identified as parts of her lung. 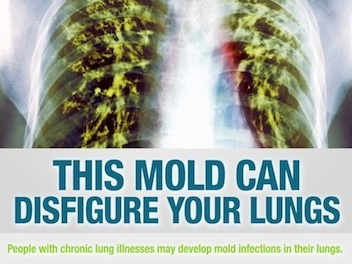 The mold had eatin away at her lungs and eventually killed her. Mold can be very detrimental to your health. This story changed the way I look at mold. I hope it will do the same for you.